In writer-director Andrew Steggall's feature debut, Beatrice (Juliet Stevenson) and her teenage son Elliot (Alex Lawther) are preparing for the sale of their vacation home in the south of France. Elliot struggles with his dawning sexuality and an increasing alienation from his mother. Beatrice in turn is upset over the sale of the house and her crumbling marriage. When ClÃ©ment (PhÃ©nix Brossard), an enigmatic local teenager, enters their lives, both mother and son are compelled to confront their desires and, finally, each other. Departure is an intimate story beginning at dawn on the first day and ending at night on the sixth, charting the end of a summer, the end of a childhood and the end of an otherwise nuclear, middle class family. The film has won several awards at film festivals and earned critical acclaim. The Upcoming said "certain to become an LGBT classic, Departure is a true work of art and is not to be missed." Lead actor Alex Lawther is a star on the rise. He played the young Alan Turing in The Imitation Game and made a huge impact in the third season of the British anthology series "Black Mirror." An English mother and teenage son spend a week in the South of France breaking up a summer home that has become one of the casualties of the boy's parents' dissolving marriage. Things become more complicated when an enigmatic local boy enters their lives. This is a heartbreaking film about love and loss by debut writer & director Andrew Steggall. It is an emotionally charged contemplation of those transition periods in life we hope that the old will be replaced by something new. 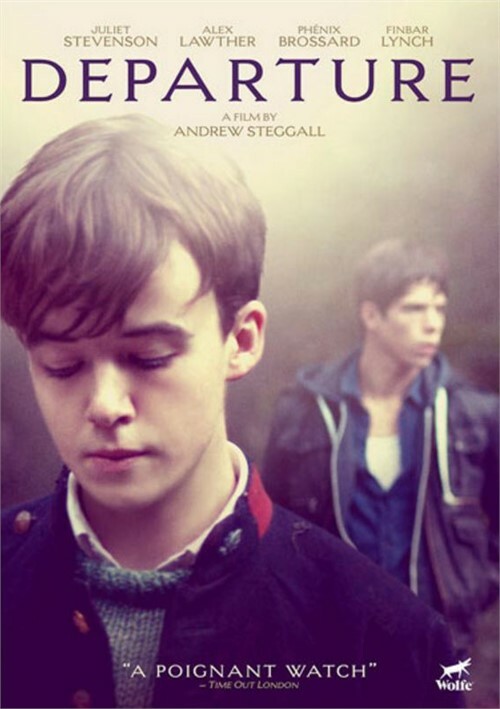 Elliot (Alex Lawther) is reaching puberty and he does so self-consciously precociously. He is discovering who he is sexually and spending long amounts of time on thinking and histrionics. He and his mother, Beatrice (Juliet Stevenson), are rather making one final visit to clear things out before the property is sold. Beatrice is clearly a wife and mother on the edge ? she wears a brave face, hanging on to those final moments before Elliot is no longer her boy and becomes a man. Her husband, Philip, has decided that the house must be sold and Beatrice, packs away memories that never quite lived up to expectations as she struggles to come to terms with saying goodbye to a piece of her life that was never her choice to begin with. Clement (Phénix Brossard), the enigmatic local teenager, enters the scene and who, inevitably yet convincingly, gives Elliot a glimpse of future possibilities. "Departure" is a coming-of-age tale combined with mid-life contemplation in such a way that we begin to think afresh about the cycles of life, and the many autumns we must hope will be followed by spring. Using the themes of longing and loss, we get a new look at an old topic. Elliot is a dreamy, military-jacket wearing poet who seeks solace away from the house. He goes into the nearby village where he sees Clement and the two strike up a friendship that Elliot sees as something much deeper. What really makes this film fascinating is that it is not only Elliott's story even though he spends a lot of time exploring his sense of self and his sexuality. This is also Beatrice's story. Her life has been shattered by the break up of her marriage and she questions herself and the choices she has made in life. Melancholy, delicate and breathtakingly shot, the film is self-aware of its nature: even Clement points out that Elliot is a bit of a cliché. What saves it from being a well-worn tale is that this is not only Elliot's story. As much as the film is about Elliot's journey, exploring his sexuality and sense of self, it's Beatrice's story too. With the loss of her marriage, Beatrice is left shattered, questioning herself and her decisions. We see Elliot as a poetry-scribbling teenage boy nursing a barely reciprocated crush on a more boldly masculine French lad, one late-summer week in southern France. Although set in the present, "Departure" comes across as a sweetly nostalgic look at a crucial time in the characters' lives. Elliot who is never seen without his vintage French soldier's jacket, moodily walks around the Languedoc countryside. He's an only child, with a seemingly absent father, and appears never to have made friends in the local village. Although he tries not to show it, Elliot is excited to win the companionship of Clément, who he first sees alone, smoking semi-naked, before plunging for an illicit swim in the local reservoir. We are immediately aware of the contrasting personalities of the two teenagers and complexities emerge the more time the two spend together. Clément provides a necessary corrective to the rather precious Elliot, teasing him for his poetic and his affectations. Ultimately, Elliot proves the more straightforward of the two youngsters, in that he knows that he wants Clément. Clement's mother is in a terminal cancer ward in Paris, he allows his buried hurt to surface. He also surprisingly submits to a lustful kiss from Beatrice, and a little bit more from Elliot who is eager to have human contact. The film is a sustained, if occasionally rather languorous, mood piece that often uses water imagery for metaphor and meaning. The use of detail is stunning even though we might grimace each time Beatrice tells Elliot as she would tell a child to wash his hands. By the time Elliot's father (Finbar Lynch) arrives to sign the deed of sale, more secrets are exposed and the family begins to fall apart more quickly as Elliot's father secrets and sexuality are also exposed. The cinematography is gorgeous as is the soundtrack but it is the encounters between the three main characters that we follow as they steal our hearts. Here is a film with a singular narrative that portrays a profound evolution of the characters. I can see how this can become a classic film.